Russell Teagarden is an Editor of the NYU Literature Arts and Medicine Database and helped lead the Medical Humanities elective at the School of Medicine this past winter. 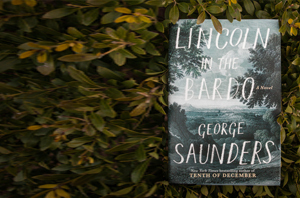 In this blog post, he experiments with creating a text collage from recent reviews of George Saunders novel, Lincoln in the Bardo. George Saunders is well known for his inventive and affecting short stories. 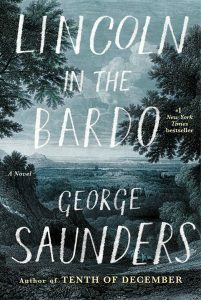 Lincoln in the Bardo is his first novel, and as described by Charles Baxter in his review in the April 20, 2017 issue of The New York Review of Books, it “doesn’t resemble any of his previous books…nor does it really resemble anyone else’s novel, present or past. In fact, I have never read anything like it.” The story is told by a chorus of spirits or ghosts in a “bardo,” which is a Tibetan limbo of a sort for souls transitioning from death to their next phase. Saunders rarely gives any individual spirit more than 2 or 3 lines of dialog, and he intersperses short snippets from historical texts- some real, some not-to provide contextual background. Of particular interest to the medical humanities community will be the focus on the well-trodden subject of grief through this experimental approach. The book has attracted the attention of many serious critics, so many in fact, that they can be assembled into a chorus to derive a review of the book in the book’s format. I have thus taken excerpts from published reviews, most real, a few not, to produce a review that covers how the book is laid out (I), how the bardo works (II), how the story flows (III), and how it’s critically received (IV) as can be told by a chorus of reviewers in a bardo of their own. The entire book seems to consist of nothing but epigraphs, which themselves turn out to be either historical sources (some real, some invented) or the chatter of spirits, indiscriminately mingling with one another. After a while, the reader begins to recognize the unique cadence of each spirit. The purposefully confusing form adds a disorientating but dramatic element to the book, and forces the reader to focus. Readers with conservative tastes may (foolishly) be put off by the novel’s form—it is a kind of oral history, a collage built from a series of testimonies consisting of one line or three lines or a page and a half, some delivered by the novel’s characters, some drawn from historical sources. The narrator is a curator, arranging disparate sources to assemble a linear story. The Lincoln of the title is not Abe but Willie, the president’s 11-year-old son, who dies of typhoid just hours before the novel begins. Willie may be the Lincoln in the bardo, but the bardo is really in Abe. Lincoln in the Bardo is set in a Washington cemetery in 1862, amid the resident population of ghosts. Using a format that combines a playlike assemblage of voices alternating with chapters composed of quotations from historical sources, it depicts how the ghosts respond to the arrival of Willie Lincoln, the president’s son, who died of typhoid at age 11. The cemetery is populated by a teeming horde of spirits—dead people who, for reasons that become an important part of the narrative, are unwilling to complete their journey to the afterlife and still hang around in or near their physical remains. The novel is told through their speeches, the narrative passing from hand to hand, mainly between a trio consisting of a young gay man who has killed himself after being rejected by his lover, an elderly reverend and a middle-aged printer who was killed in an accident before he could consummate his marriage to his young wife. Those voices, and Willie’s, come to us in snatches, usually brief, little bursts of subjectivity and consciousness tumbling over one another, sometimes conversing, sometimes interrupting, squabbling, contradicting. The novel operates like a cross between a film script and an oral history, much of it narrated by two woebegone ghost pals. It moves from collages of quotes from historical documents and textbooks about Willie’s death (some of which Saunders appears to have invented) to a riotously imagined story of the ghostly inhabitants of the graveyard. To deepen the novel and give it context, Saunders regularly interjects bits of history and reportage (some of which he has created)—another layer of voices, as it were. Are the nonfiction excerpts from presidential historians, Lincoln biographers, Civil War chroniclers—real or fake? Who cares? Keep going, read the novel, Google later. It may take a few pages to get your footing, depending. The more limber won’t be bothered. When someone dies, Tibetan Buddhists believe that they enter the bardo of the time of death, in which they will either ascend towards nirvana, and be able to escape the cycle of action and suffering that characterizes human life on earth, or gradually fall back, through increasingly wild and scary hallucinations, until they are born again into a new body. The bardo is an element of Tibetan Buddhism, a way station between incarnations in which souls prepare themselves for their next life. Time and space in the bardo Saunders conjures are the same for its inhabitants as they were for them in their former earthly domains. This bardo restricts its inhabitants to the geographic area of their burial grounds they were buried in Georgetown and so their bardo is in Georgetown. They measure their time in the bardo in “years.” I was expecting something more other worldly. This is not a straightforwardly Tibetan bardo, in which souls are destined for release or rebirth. It is a sort of syncretic limbo which has much in common with the Catholic purgatory, and at one point we are treated to a Technicolor vision of judgment that seems to be drawn from popular 19th-century Protestantism, compounding the head-scratching theological complexity. This grey purgatorial state is the ‘bardo’ of the novel’s title. It has little in common with the Buddhist concept of that name, which envisioned a sort of metempsychotic wormhole that connected successive cycles of rebirth. In Saunders’s bardo, a Dantean contrapasso transforms the ghosts in accordance with the moral ailments that afflicted their lives. For non-Buddhists, it is a recognizable limbo, full of milling entities who for one reason or another will not take the next step of the journey. Like the ghosts we know from stories, they are tied to their former existences, trapped by an idea of themselves, and can’t leave until they are ready. Unfolding over one night in a graveyard not far from the White House, it tells a story that is, by turns, simple and complicated, tracing both a father’s grief and its effect on the Republic he serves. His father, already beset by internal doubt and external uproar a year into the American civil war, was propelled by restless grief to walk the dark and stormy Georgetown cemetery where Willie’s body lay. His presence upends the order of the cemetery. For one thing, “young ones are not meant to tarry” unburdened by a lifetime’s accumulation of failures and regret, they usually pass over quickly. But a visit by his grieving father agitates the boy, as well as his graveyard neighbors. Willie, like other children, is expected to pass on quickly to the afterlife proper, instead of remaining in the cemetery, but because of his father’s grief he is tempted to stay. The boy’s ghost wishes to stay in the purgatory of the graveyard, desperate for a few last moments with his father. 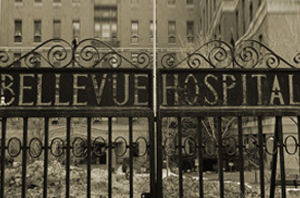 There is a touching trio of elders—names deliberately written lower-case who take Willie under their wing: roger bevins iii, a young gay man covered in eyes; hans vollman, who lugs around a “tremendous member”, having been taken ill while anticipating his marriage-bed; and the reverend everly thomas. When the ghosts find that they’re able to pass into Lincoln’s body as he sits in the mausoleum, the reader is suddenly privy to the president’s thoughts, and the novel discovers new depths. The father must say goodbye to his son, the son must say goodbye to the father. Abraham Lincoln must stop being the father to a lost boy and assume his role as a father to a nation, one on the brink of cataclysm. Willie’s mother, Mary Todd Lincoln, does not figure in this story much more than descriptions of her taking to her bed. This is about a father’s grief. Lincoln in the Bardo is part-historical novel, part-carnivalesque phantasmagoria. Saunders’ primary intention in the novel: to take these whirling and disparate voices miserly widows, violent grifters, drinkers, doting mothers, licentious young men, abused slaves (even in this realm cast into a less hospitable portion of the graveyard) and unite them in their common humanity. The polyphonic narrative of the spirits is interleaved with constellations of artfully arranged quotation from primary and secondary sources about Lincoln’s life, which Saunders uses to show that observers can be unreliable about the motivations and mental state of the president, and that even such questions as whether the moon shone or not on a particular night can be distorted by memory. And they lend the story a choral dimension that turns Lincoln’s personal grief into a meditation on the losses suffered by the nation during the Civil War, and the more universal heartbreak that is part of the human condition. In Lincoln in the Bardo, the immense pathos of the father mourning his son, all the while burdened with affairs of state, gives these sections of the book a depth that isn’t always there when Lincoln is off stage. The busy doings of the spirits are entertaining, and Saunders voices them with great virtuosity, but the tug of Lincoln’s grief is sometimes too strong for them not to feel like a distraction. In the midst of the Civil War, saying farewell to one son foreshadows all those impending farewells to sons, the hundreds of thousands of those who will fall in the battlefields. The stakes grow, from our heavenly vantage, for we are talking about not just the ghostly residents of a few acres, but the citizens of a nation—in the graveyard’s slaves and slavers, drunkards and priests, soldiers of doomed regiments, suicides and virgins, are assembled a country. Saunders presents Willie’s death as a turning point for Lincoln—will he be able to move on from his grief, to draw on it as a source of strength in the battle ahead, or will it crush him, the acuity of his own loss meaning that he sees Willie in every dead soldier? One of the novel’s conceits is that by occupying the same space, the spirits can experience a dissolution of interpersonal boundaries, understanding and feeling sympathy for each other in a mystical way. It is hard to be specific without spoiling the plot, but Saunders uses this device to imply a cause for Lincoln’s later signing of the emancipation proclamation, a move that seems glib and reductive, a blemish on a book that otherwise largely manages to avoid sentiment and cliche. This is a small quibble. A portrait of Lincoln is not the point of this novel…the book provides slightly hidden away, but still quite visible a form of instruction concerning acceptance and grief. It’s tempting to trace some sort of connection between Lincoln and the Bardo and the political climate in which it has been published, but to do so, I think, is to miss the point. 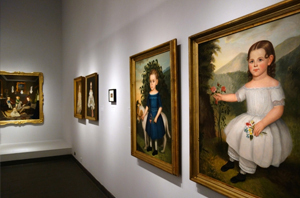 Rather, its concerns are existential, metaphysical, even when politics enters the work. Saunders’s beautifully realized portrait of Lincoln—caught at this hinge moment in time, in his own personal bardo, as it were that powers this book over its more static sections. Life is chaos and history a story, and even the greatest of our leaders are merely humans, after all. The recognition sits at the center of “Lincoln in the Bardo,” which is a book of singular grace and beauty, an inquiry into all the most important things: life and death, family and loss and loving, duty and perseverance in the face of excruciating circumstance. The supernatural chatter can grow tedious at times—the novel would have benefited immensely from some judicious pruning. The novel is funny, poignant, and smart. But it’s not an escape, just like it’s not really about history. This is a novel that’s so intimate and human, so profound, that it seems like an act of grace.